We simply can't believe that Christmas is just a few days away now. As much as we don't like to admit it we always seem to wait until the last minute for a few things here and there. This year stocking stuffers is what we waited on until the last minute. Are we the only ones? And let's not mention a little thing called wrapping. Here are some fun things we do have our stockings this year for the kids, but please share any ideas you have so that we can wrap up ours! Lip Stuff - Whether its Lip Smackers, or Chapsticks, or sparkly lip gloss (well minus the boys on the sparkles) all our kids like it all. From Skittle flavored to Ninja Turtle themed. Anything fun for the lips is usually a hit in and outside of the stocking year round. iTunes - We've learned long ago that you can be three or ninety-three and an iTunes gift card will still excite you. We always include these in small denominations in everyone's stocking because then the kids buy their own apps, songs, or shows and think it is fun to be in charge of their own "money". Socks & Underwear - We like to throw in some necessities into our holiday gift giving sometimes and have found that socks and underwear make for great stocking stuffers. The boys this year are all about the Under Armour "tall" socks, and the super hero themed ones are just plain fun! Toothbrushes - And while we are on the subject of necessities - toothbrushes. We throw these in there because the kids always think its fun to get a new one, and it helps us feel a little less guilty about the candy it sits next to in the stocking. Magazines - Magazines are always a fun one to throw in. 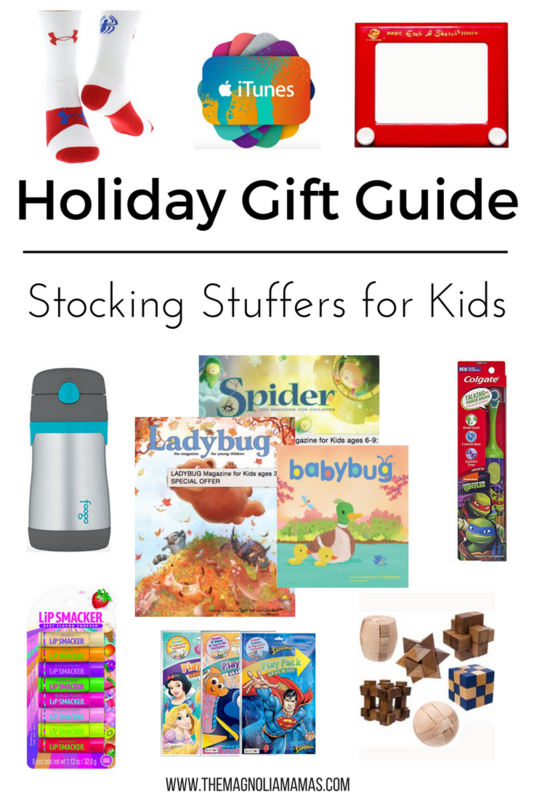 We love that it is a non-toy item, and a subscription is kind of a fun gift that keeps on giving throughout the year. Plus our kids absolutely LOVE getting their own mail, and look forward to when their magazines arrive every month. Our favorites are these magazines from Cricket Media. 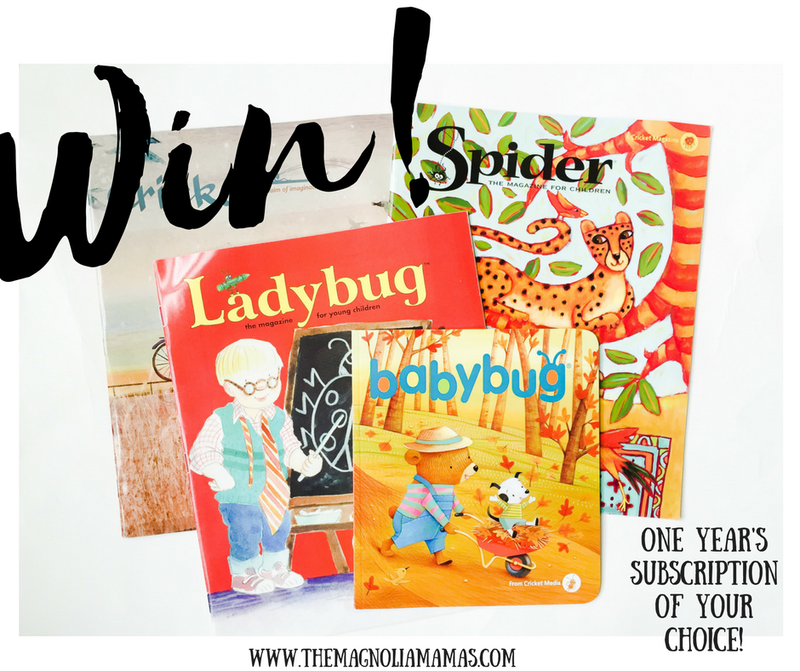 They offer a little something for each child from tots to teens, and love that with their "Double the Giving" campaign we are able to donate a subscription to a charity of our choice when we renew/start our subscription. Brain Games & Puzzles - Small travel sized "brain" games or puzzles are also fun to stick in the stockings. This year we are going old school with some fun mini etch-a-sketches. Cups - This one is easy, practical, and a great idea if you have a baby you are trying to think of. These stainless steel cups are our absolute favorite for kids and babies. Grab & Go Packs - These are the best inventions ever! These little "grab & go" packs are the best thing. They include everything from coloring utensils to stickers to mini coloring/game books and the kids love them. We love keeping them in our cars or having them in our bags for when we might need them during down time. They've saved us a time or two and are one of our favorites to include in stockings. Now what will be in your stockings this year? Just in case you need something a little extra for your stockings or if you are like us - waited until the last minute to think of things - we are here to help! We have partnered with our friends at Cricket Media to give away one year's subscription to one of their amazing magazines! The winner will be able to choose what magazine they would like. To enter all you have to do is leave a comment below letting us know something fun that will be in your kids stockings this year. Winner will be drawn randomly and announced on Monday, December 26th. We love books and magazines around our house! Tomorrow is my last day to get any last minute shopping done, thanks for the advice. Love these! I just grabbed one of those grab packs for a last minute gift. They're so great! And my daughter is obsessed with lip stuff! Great ideas ladies. I've filled our girl's (3 1/2) stocking with some princess movies since she's all about princesses and some cute character undies (can't go wrong with anything sofia the first these days). for our little boy (21 mon)who's into cars and trucks I opted for some matchbox cars and some touch and feel and flap books. Love the magazine idea! New toothbrushes and toothpaste are always in my kiddos stockings. I like the idea of adding magazines. I love all the cute gift ideas. I will be gifting coloring books and markers this year for my kids. One stocking stuffer my daughter will be getting is a Disney Princess sing along CD, and my son is getting a R2D2 flashlight. Love your ideas! These are some good last minute ideas! These are great suggestions! We always get new movies, since we rarely buy them the rest of the year. And the adults usually get a gift card or two... Of course a little candy and small odds and ends. My hubby and I are actually getting socks ourselves this year.